Hello, and welcome to another Great Fermenations recipe of the month post! Being January and thus the in the heart of winter, I thought it would be nice to focus on a style that is often overlooked and can make a great winter beer: Baltic Porter! Before we dive headfirst into the recipe, first a little history on the Baltic Porter. Of course, you can’t even say the full style name without saying “porter,” a style that originated in England in the 18th century that quickly became popular among the working class. Many of those working at shipyards (“porters,” as some of them were known) not only drank the style, but also loaded ships full of it to be sent across the world to different parts of the burgeoning British Empire. While we all think of the story of IPAs being brewed and sent to British holdings in India, porter was also sent out to other British ports of calling in Australia and along the coast of the Baltic Sea. The strongest versions retained popularity there, and brewers in Baltic countries such as Finland and modern-day soon adopted the style, using brewing styles and techniques popular in those countries. Because they were further north and influenced by continental bottom-fermenting techniques from Germany, they produced a lager version that was influenced by what we now know as Russian Imperial Stouts. Baltic Porters are generally brewed as lagers, although it is not uncommon to find one brewed with ale yeast. In this recipe I am going to stick with lager yeast, but note that a clean ale strain such as Wyeast 1056, Imperial Organic Yeast Flagship, or Safale S-05 can be used. You may choose to use an ale yeast, as they are generally easier to work with than lager strains and are more familiar to most brewers. Ferment near the low end of the temperature range for any of these yeasts to keep the flavor profile clean. Whether you decide to go with lager or ale yeast, be sure to pitch plenty! 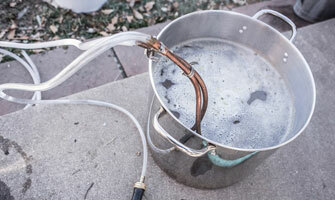 Lower fermentation temperatures will cause beer to ferment slower, and a higher cell count will help you conduct a clean and proper fermentation. For this recipe, we are going to go for a Baltic Porter in the middle of the style range. The base will be a mix of standard 2-row and Munich malt. The Munich malt will give it a bit extra maltiness and body, and is found in several Baltic Porter recipes. Carafa II will give us color without harsh bitterness, Brown malt will add a nice coffee-roastiness, and Special B will add a little plum-raisin sweetness and residual sugar. Our one addition of Magnum hops will give enough bitterness to balance, but not too much hop character. Ferment this all with a nice, malty yeast strain such as Wyeast 2206 Bavarian Lager or Imperial Organic Yeast Fest, and we’ll have a clean, somewhat sweet and rich beer like those found around the Baltic coast! Ready? Let’s give this brew a try! 1 oz. Magnum hops (12.4% AA), added at the beginning of the 60 minute boil. 2 to 3 “Pitch Right” cans (or make an appropriate starter) of Imperial Organic Yeast L02 Fest, or 5 to 6 packs (or make an appropriate starter) Wyeast 2206 Bavarian Lager yeast. If using a neutral ale strain instead, we recommend 3 to 4 packs of Wyeast 1056 American Ale, White Labs WLP001 California Ale , or Safale S-05 dry yeast. If using an ale yeast, chill to 55-58F, pitch yeast, and allow to ferment at 55-58F for 2 to 3 weeks. A diacetyl rest 8 to 10 degrees higher than fermentation temperature is recommended for 2-3 days near the end of fermentation. Check the gravity, and perform the diacetyl rest when gravity has dropped 2/3 to 3/4 of the way to the expected final gravity. Once final gravity is reached, it may benefit from further conditioning at 55-58 for another week or two before bottling or kegging. Extract Version: While it is not going to be the exact same, this will give you a beer of similar starting gravity, with a slightly higher finishing gravity. Replace the 2-row brewer’s malt and Munich malt with 6 lbs of light dry malt extract and 3.3 lbs Munich liquid malt extract. Steep the specialty grains (Carafa II, Brown and Special B malts) at 150-155F for 30 minutes using a muslin grain bag. Remove the bag, allowing the grains to drain into the boil kettle. Turn off the flame and dissolve the extract in the kettle. Turn the flame back on, bring to a boil and proceed as above. NOTE: as the extract version may be less fermentable than the all-grain version, you may experience a higher finishing gravity of roughly 1.018 to 1.020 when brewing the extract version.